Faith Hope Love Tattoo: Faith, Hope and Love are often categorized as the emotional symbols but they do play a vital role in everyone’s life. It also has a significant role in almost every human culture. Faith, love and hope are referred to God as a motivator, one who cause miracles and enables human to keep going even in difficult situations. It is true that seeing a faith, hope and love tattoo is very inspirational because it brings a positive change in one’s mind. These concepts are deep and manifest inner strength of a human being by making life easy. Most People frequently use tattoo symbols Heart, Anchor, Cross or letters Faith, Hope, Love or both together with other signs such as infinity, heartbeat, dove to define their beliefs. If you want to live a peaceful life, have FAITH, HOPE and LOVE in life. The concepts let us live a peaceful life for a better tomorrow. Even these words leave a positive impact because the related tattoo designs and ideas are noteworthy. The amazing colors and placement of tattoos surely will flaunt your mind. The placement of tattoos enables human to rescue from the opposing belief that one`s experience in reality. Most of the time bad experiences do envelope you but getting inked with faith hope love tattoos will surround the light of goodness. It is better to stick with the tattoo design that makes you feel happy. However, it is difficult to express these emotions but people have found a great way by inking themselves permanently to express faith, hope and presence of love in their lives. According to the bible, faith, love and hope last till the last breath of a human. Such tattoos do depict a meaningful message which cannot be expressed through words. Without faith, hope, love, one`s life is worthless. The tattoo ideas and designs related to faith, hope, love do show devotion that you believe in them particularly. Indeed, there are very fewer people who truly believe in such concepts but life does move on with faith, hope and love more peacefully. Consequently, words will run short to explain the significance and meaning of these words. They surely rejuvenate the spirit so let’s go through the best and inspirational faith, hope and love tattoos. Heart is used for love or charity, anchor is for hope and cross is for faith. Cross and anchor were used in Christianity in old times for strong belief. Anchor sign is popular among pirates and sailors for hope. 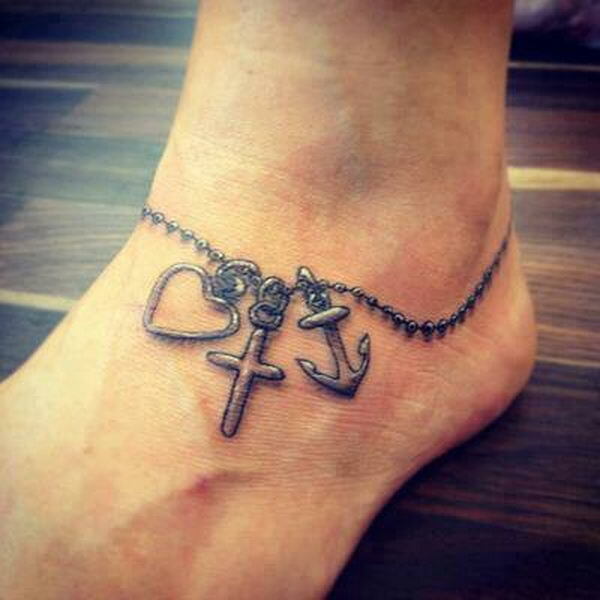 While there are many symbolic associated meanings for anchor. Hope definitely anchors one soul while faith makes a human whole and love casts out every sort of fear. Dove is a bird that denotes peace, love, tranquility and harmony. It is also a Christian symbol symbolizing hope and white color shows faith. Hope you will like our collection of spiritual and realistic faith hope love tattoo patterns. They all are definitely amazing and mesmerizing. Don’t forget to tell us in comments about your favorite tattoo design.